Born in Virginia and raised a Texan, Randy has played guitar for over 40 years. 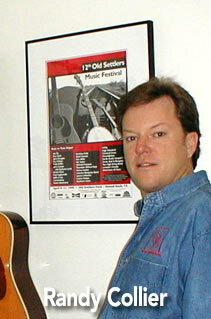 Music was in his family at an early age with a mix of Texas Swing, Bluegrass and popular acoustic performers. He played in the Dallas/Austin area with his own group, RedEye, in the ‘80’s and 90’s and played with The Greencards in ’02 and ’03 while they gained traction in Austin. He was president of the Central Texas Bluegrass Association from 1991-1994. Then, serving as president of The Old Settler’s Music Festival until 2006, he took it to one of the top five of its kind in America. He is a regular attendee/participant in the International Bluegrass Musicians Association’s annual conference serving on panels and workshops. Although known for some occasional hot leads, he is most notably known as a powerful rhythm player. He’s a real workshop pro, and has worked with some of the best musicians in the world in work shops and on stage.